Congratulations to the 2018 Great Places in PA Award Winners! 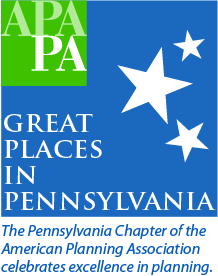 The Pennsylvania Chapter of the American Planning Association is proud to announce our Great Places for 2018 in two categories: Great Public Spaces and Great Greenways/Trails. Great Places are unique, memorable places that work not only for their community, but as a model others want to emulate – places of exemplary character, quality, planning, identity, cultural interest, and community involvement with a sustainable vision for tomorrow. 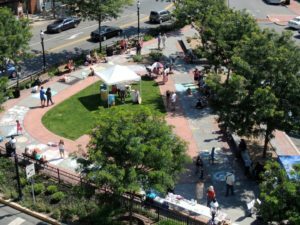 A Great Public Space is a vibrant place where people of all ages gather to play, socialize, enjoy a meal or concert, relax, or just enjoy the outdoors. It is a focal point for community events, which bring people together and bolster the economy. The 2018 Great Public Spaces are familiar below. Buhl Park: In 1911, Frank Buhl acquired 300 acres of land in the City of Hermitage, Mercer County, with a vision of creating “a place of recreation” for residents. He subsequently donated the land and facilities to the Trustees in 1915, together with funds to operate and maintain the Park. The Trustees, working collaboratively with the Buhl Park Corporation and others, have continued to carry-out Mr. Buhl’s vision. Today, the Park includes a diverse array of facilities for persons of all ages and abilities. Among the facilities is a 9-hole golf course, driving range, disc golf course, swimming pool, playgrounds, dog park, arboretum, fitness trail, a 9-acre lake, tennis courts, a Nature Explore learning center, and an outdoor Performing Arts Center. 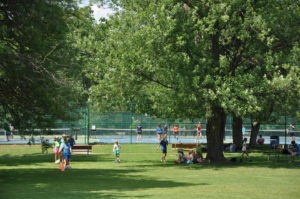 Many events occur in the Park, such as sporting tournaments, concerts, festivals, Youth Fishing Day, and “Buhl Day,” a huge community picnic celebrating the Buhl legacy. With over 400,000 visitors annually, Buhl Park is proclaimed to be “a place where lives happen and memories are made.” Here’s a link to an excellent news article about Buhl Park’s designation as a great place. Central Park: This 140 acre Park is the focal point of Doylestown Township in Bucks County. Residents and visitors gather at the Park for recreation, social interaction, and community events. Kids Castle, a majestic playground inspired by the castles of Henry Chapman Mercer and enclosed by a fence lined with one of a kind donated artwork, is one of the highlights. 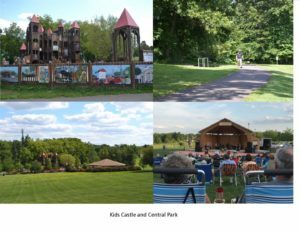 Central Park is also home to an amphitheater, outdoor fitness equipment, picnic pavilions, sport fields and courts, trails with connections to neighboring municipalities, and environmental education areas (wetlands, native plant garden, natural habitats). Among the trails is a sensory trail dedicated to developing sensory experiences for children with special needs. The Park, which attracts individuals and families from all over the world, is truly a place for community gathering, inspiration, and making countless memories. Emmaus Triangle Park: Emmaus Borough, in Lehigh County, is the only town in Pennsylvania with a triangle as its center. The triangle, which has been part of the Emmaus community since 1759, originally served as the location for crops and livestock to benefit townspeople, then as the site of a hotel. Following demolition of the hotel in 1923, the triangle was officially established as a park. Today, people of all ages frequent the Park, locally referred to as “The Triangle,” to enjoy passive recreation and community events. A special feature, located in the heart of The Triangle, is a fountain that is lighted during the evening hours May through October. Other features include park benches, drinking fountain, flowers, trees, calendar kiosk, and wrought iron fencing. Among the events hosted in the Park are an Old Fashioned Christmas Lighting, SnowBlast Winter Arts Festival, Farewell to Summer Festival, educational presentations, and the starting point for foot and bike races. Residents and visitors alike take pride in this special place. 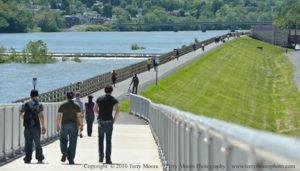 Susquehanna Riverfront: This historic and scenic section of the West Branch Susquehanna River waterfront, in the City of Lock Haven and Woodward Township (Clinton County), was once threatened by a controversial US Army Corps of Engineers dike-levee flood protection project. In an effort to protect features treasured by residents, a local planning team participated in the design phase and was successful in having five key amenities included: a riverwalk; a pavilion, access ramps, bleacher seating, and a concrete swimming enclosure to revive the YMCA beach; an amphitheater; a Riverview Park; and a public boat launch. Since completion of the flood protection project in 1995, the City, Township, and others have partnered to implement riverfront improvements and host events to enhance public enjoyment of this cherished area. Popular events along this lively riverfront include the Labor Day Speedboat Regatta, Riverfest, Great Island Adventure Triathlon, and a summer concert series on a floating stage. Residents and visitors find the new riverfront to be a special place for all to enjoy. Village of Boiling Springs: Located in the heart of the Cumberland Valley, Boiling Springs gets its name from 30 artisanal springs in the area that appear to “boil” up from the ground. This quaint, historic, and walkable hamlet offers a variety of restaurants, shops, cultural sites, and recreational activities. A focal point is Children’s Lake, a year-round home to a variety of aquatic life and waterfowl that offers fishing, boating, and a place for community gatherings. Boiling Springs is recognized on the National Register of Historic Places and the National Underground Railroad Network to Freedom, and is a designated a “Trail Community” along the Appalachian Trail. New walking trails connect the Village to nearby public parks and recreational areas. 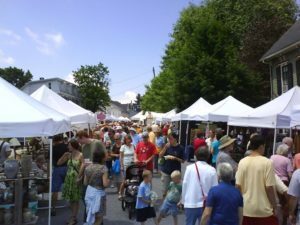 Community events, such as Foundry Day, “Anything Floats” competition, A Day at the Lake, and Labor Day Festival, attract thousands of visitors annually to experience arts and crafts, ghost tours, history tours, horse-drawn carriage rides, live music, and more. The diversity of community character, assets, and activities creates small-town charm for all to experience. A Great Greenway/Trail is a linear parcel of land or right-of-way set aside to preserve/protect open space, scenic landscapes, historical resources, natural resources and/or plant/animal habitats. It provides linkages to connect people to parks, schools, downtowns, places of employment, pristine natural areas, and/or historical structures and features. It can be limited to foot traffic or accommodate multiple users. 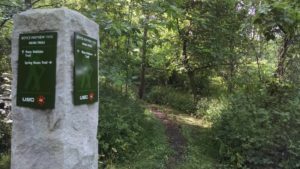 The 2018 Great Greenways/Trails are acknowledged below. Boyce Mayview Park: This 475-acre regional park in Upper St. Clair Township, Allegheny County, contains a 10+ mile trail system, portions of the which are ADA accessible. Trail users experience much environmental diversity, such as open meadows, forests, wetlands, scenic overlooks, and high value habitats for waterfowl, birds, wildlife, and plants. Green infrastructure is also prevalent in the form of pervious pavement, rain gardens, and bioswales. Additionally, the area’s heritage is expressed through interpretation of the coexistence of nature, technology, agriculture, and industry. Public-private partnerships have been instrumental in the maintenance and expansion of the trail system to allow for increased access to other Park amenities, as well as to surrounding residential neighborhoods and commercial spaces. Boyce Mayview Park is a unique asset for the community that allows persons of all abilities to enjoy the majesty of nature throughout the seasons. 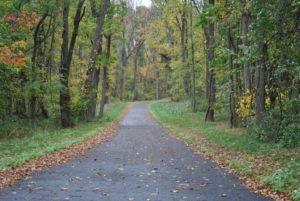 Schuylkill River West Trail: Heuser Park in Upper Merion Township, Montgomery County, serves as the trailhead for this 2.2 mile, 12-foot wide, trail that connects to Valley Forge National Park along the southern shoreline of the Schuylkill River. The trail is ADA accessible, thus accommodates people of all abilities. Along the route, there is access between the Trail and key destinations, such as employment, shopping districts, residential areas, and regional transportation options. The Trail was designed to preserve the natural environment and incorporated green infrastructure practices to manage stormwater. Much of the Trail is well-canopied and users can experience wetlands, meadows, wild flowers, and wildlife along the route. The Trail has accomplished the Township’s goal to create a “sensitively designed, safe, easy-to-use, and well-maintained pedestrian and bicycle route” that provides outdoor enthusiasts with another source of community identity and provide. Long term plans propose extending the trail eastward to connect with downtown Philadelphia. Save Our Land, Save Our Towns Inc.